St. Clement Vineyards is a small, premium winery whose history parallels the rich winemaking legacy of the Napa Valley. The winery is located on the landmark Napa Valley estate established in 1878 by San Francisco stained-glass merchant Fritz Rosenbaum, who created one of the earliest bonded wineries in the Napa Valley. 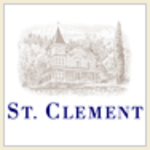 Commercial wines under several different labels have been produced on the property for over a century, but those of greatest fame began in 1975 when the St. Clement label was born.